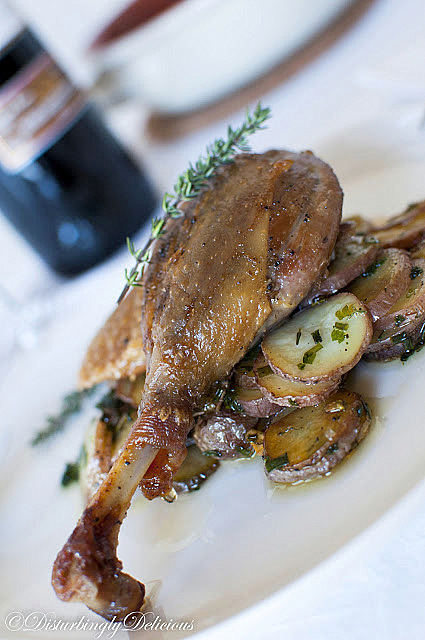 French cuisine is one of my favorites, after the Italian one, of course I’m not saying that the French Chefs are not good! Oh, no! They cook, and they are very good at it! The only problem is that we all know that French cuisine is not the lightest in the world. However, from time to time we need to treat ourselves with something typically French even if we know that we’ll have to go for a longer run during the week :). 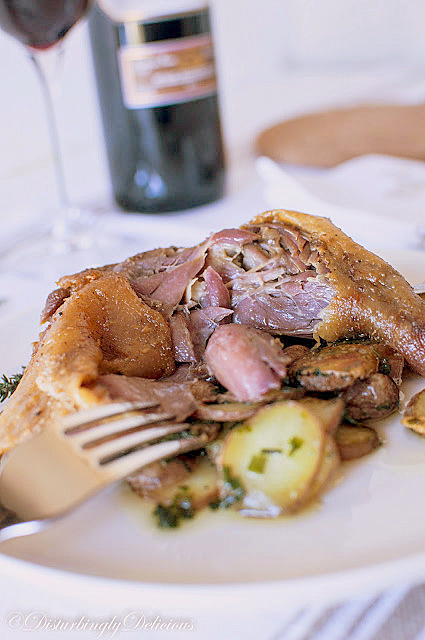 And if we think of the French cuisine we could not avoid thinking of the extremely delicious confit de canard, a typical dish of Gascony. It’s not so complicated to prepare it but you need a bit of time. 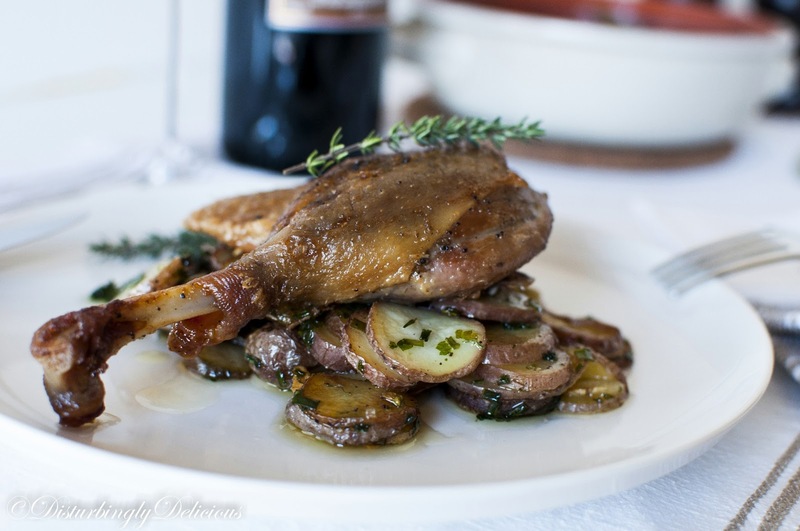 As I had two beautiful duck legs I transformed them in confit and to maintain lunch in the French area we served them with potatoes sarladaises and a glass of Barton & Guestier, Bordeaux Reserve and had a great lunch with the lovely people Mixtopia. Rub the duck legs with the garlic cloves. 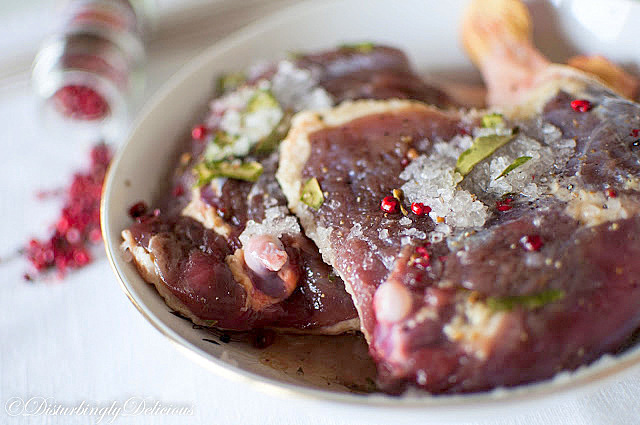 Mix the salt with the peppercorn, thyme and bay leaves. 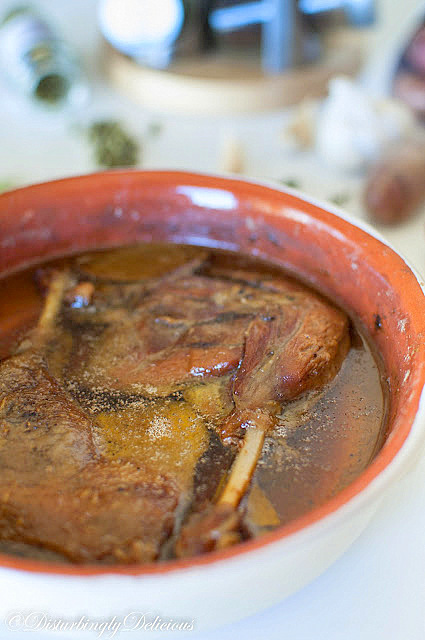 Rub the duck legs with this mixture and put them in a glass bowl. Cover the bowl and refrigerate up to 48h, turning once. 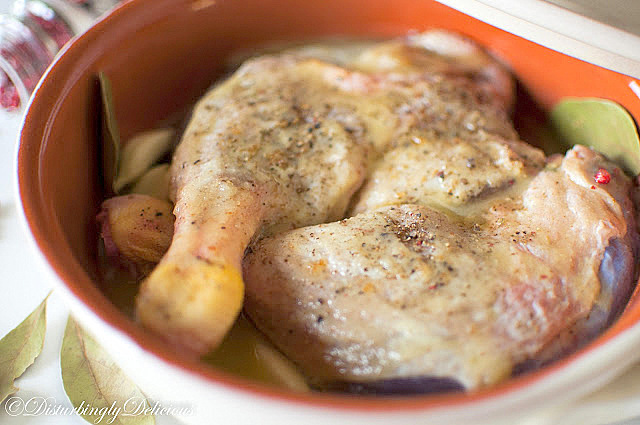 Rinse the duck legs and set them in a baking dish adding few more garlic cloves if you want.Cover them with the duck fat. Preheat the oven to 120°. Set the backing dish into oven and bake uncovered for 4-5 h until the meat is very tender and shrinks away from the bone. Normally, the meat cooked this way, could be preserved for few months in the fat in which it was baked, but I doubt you can resist. We served it with Potatoes Sarladaise, a dish specific to Périgrod. *The original recipe does not contain chives and thyme. 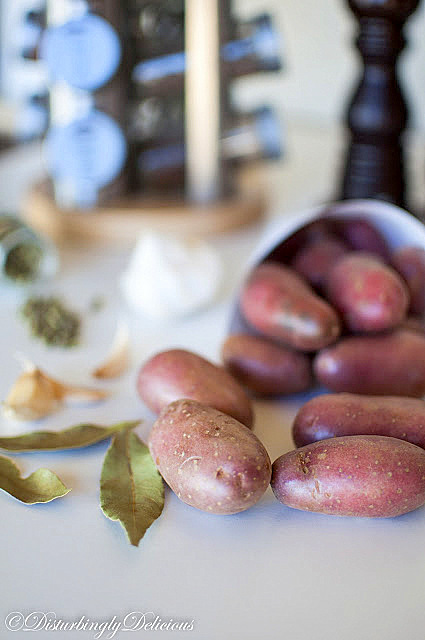 Wash the potatoes and slice them with a mandolin. (The potatoes I used did not need to be peeled. In case you use other type of potatoes, peel them). Pat dry the potatoes slices with paper towels. Heat the fat in a large pan. Sauté the potatoes in the hot fat over high heat, turning constantly until they start becoming golden-brown. Season with salt and pepper. Add sliced garlic and the chopped chives and parsley. Cover and cook over medium heat for cca 20-25′, shaking the pan from time to time. The potatoes will be golden-brown, crispy outside and soft inside. 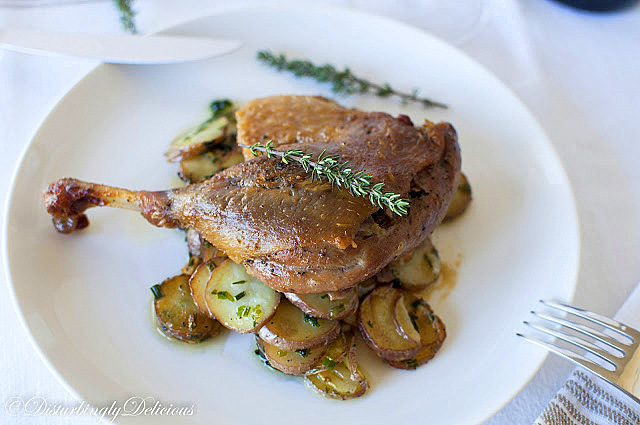 Serve the Duck Confit on a layer of Potatoes sarladaise. 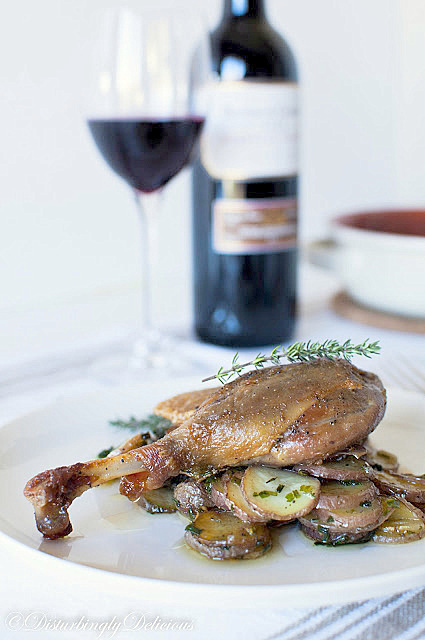 A glass of red wine (we chose Barton & Guestier, Bordeaux Reserve to keep it in France :)) makes a perfect match to the dish. Așa ceva aș mânca și eu. Când o să prind o rață, pregătesc și eu acest confit:). Si cat de bine arata!!! Arata demential ratusca asta! Vreau si eu o portie. @ Draga mea Maya, oooooh daaaaa!! !Stiu eu cartocii sarladaise de la tine de pe blog aia cu ciumpercute. Yum!!! Sa stii ca o sa ii incerc si eu asa cu ciumperci ;). Cat despre confitul tau, jos palaria!!! Cat am mai poftit eu pe langa pozele tale. Cat de bine arata, e un deliciu!! Am si eu o rata in congelator…numai bine s-a nimerit reteta ta! As putea spune ca ai “eliminat ” toate ratele din imprejurimi Arata excelent! 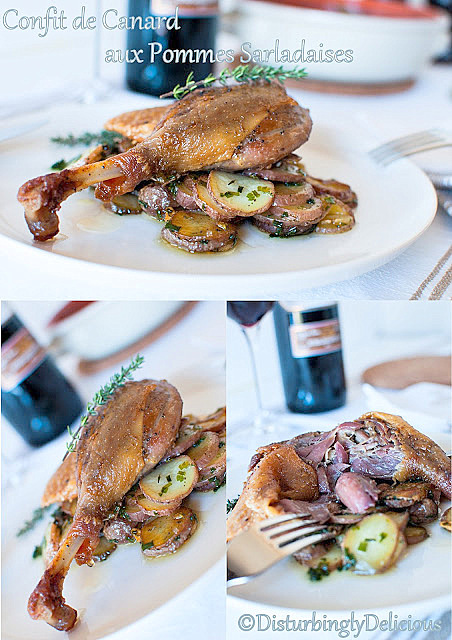 Nu iert confit-ul de canard pe unde il prind. Imi place la nebunie. @Paula, te sfatuiesc sa sacrifici rata si sa pregatesti confit-ul ;). Sunt sigura ca o sa iti placa. Ah moi je suis vraiment fan. Très bon blog. Chef Tiramisu.